His chubby little hands clench up into fists and he begins to rub his eyes. “You getting sleepy,” I say to him. He responds with a tiny whine. His body curls up and his head, suddenly way to heavy for his body, drops on my shoulder. 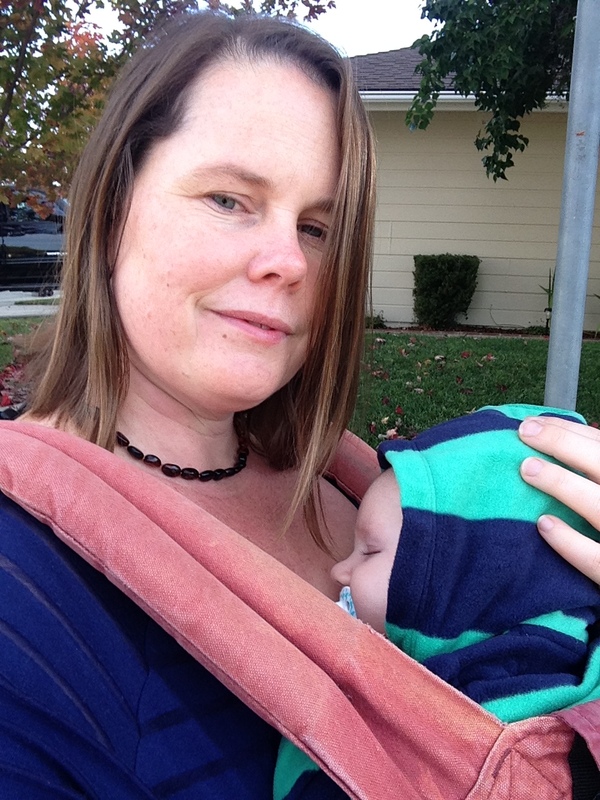 I grab my well-worn baby carrier and strap him in. I can feel the tension release immediately. He knows what is coming. Stepping into my shoes we head outside. It’s fairly crisp and the air smells like logs burning. I cradle his head with one hand and we begin to walk. We stop under my neighbor’s tree and both look up. A bird is chirping loudly, but I can’t find him in the tangle of yellow and brown leaves. After a moment, my sweet little baby nephew begins to whimper. He looks away from the tree and rubs his face against my chest. I used to know every tree, bush, flower and house in my neighborhood. It was as familiar to me as my own backyard. The enormous plum-tree that exploded pink flowers all over the sidewalk in the spring followed by loads of squishy plums that my kids loved to collect. The tiny stone turtle that could only be seen under the rose bushes in the winter after the neighbors cut them back. The crazy, barking dog that would run at the fence if you didn’t remember to cross to the other side of the street. The grove of twisty trees that dropped plenty of sticks and little red balls just right for children’s hands and imaginations. The giant black bees that favored the climbing morning-glory that grew along the fence of the house with the giant trampoline in the backyard. The house with an abundance of pomegranates growing so far over the fence that you’d be able to pick some in the fall without them noticing. The brick house that grows giant sunflowers in the summer that we just had to stop and measure ourselves against every time. The house with several towering pine trees that always provided us with pinecones for our nature table. As I walk around my neighborhood now, with my nephew sleeping soundly on my chest, I suddenly feel lost. It all looks so foreign and bizarre. Where did that grove of palm trees come from? When did that retaining wall go in? Where are all my memories? It seems that my neighborhood has continued to grow, just like my kids. While I stay tucked inside, living with sadness and longing for the past, time just keeps moving forward. My babies are giant kids who no longer enjoy walks in the neighborhood with their mother, certainly not strapped to my chest. They are smart, creative, intelligent children who love to play board games, read books, create art and make things out of string. They spend hours away at school each day and hardly seem to need me when I pick them up. As I walk home, I am suddenly struck by everything. The beauty of the clouds and the vastness of the sky above. A mass of deep, dark purple flowers growing next to a small ceramic snail. An arch covered in a rich green tangle of ivy. A lawn of dark, thick grass that is dotted with five baby pine trees in a star pattern. A square garden box made of redwood that is growing pumpkins, squash and kale. I feel like a small child out on my walk in the big, wide world. I pick up a golden leaf that I can’t bare to leave behind; stuck by how soft and cool it feels as I trace the vein pattern with my finger. I stop and watch a group of blue jays fight in a bird bath and laugh at them. I see sparks in my neighbor’s garage as he solders something together and I’m excited by what it might be. When I get home I lay my nephew down to finish his nap and I pick up my Bible. I’m finding my way back to God and I can feel him speaking to me. I pray for peace and for God to open my eyes to the beauty around me every day. I pray for forgiveness and strength. Before I know it, little baby Logan awakes. He stirs sweetly and I quickly go to him. He smiles up at me with his entire body. I return the smile with mine. This entry was tagged Baby, Fall, God, Growth, Love, motherhood, Nature, Nephew, Peace, Time, Walking. Bookmark the permalink. Very moving. I needed this today. Thank you.